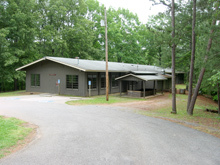 Having a meal for your family or hosting a party for hundreds of people can all be accommodated by the facilities available at Red Top Mountain State Park. 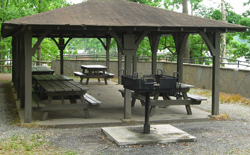 There are individual picnic tables and numerous group picnic facilities for small and large picnics. If you do not want to chance planning a large event and have it rain, Red Top even has buildings you can rent to host relatively large groups. The information below outlines the types of facilities available, where they are located within the park, and the applicable fees involved. There are picnic tables along Red Top Beach Road and near the boat launch found off of Webster's Ferry Landing Road. Each table has a barbeque grille located next to it. 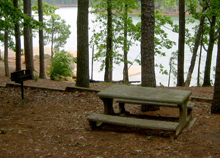 Most of the picnic tables are located on sites that either offer nice views of Lake Allatoona or are found right along the lakeshore. Restrooms are either close at hand or are a short walk away. The are no fees, other than the park entry fee, charged for the use of the individual picnic benches and grilles. You are expected to clean up after yourself before you leave any site that you use. All of the group picnic areas are found in one of two areas: off of Red Top Beach Road and off of an access road just inside the park's western entrance. Each site is set up similarly but there are differences in how close they are to the lake. 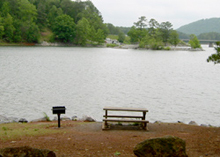 Some sites are quite close to the shore, others overlooks Lake Allatoona, and some are set quite a ways off from the lake. Each group picnic site is set up similarly. There are a number of picnic tables set on a concrete pad and this arrangement is covered by an open sided roof. Off to one side of the pad is a large barbeque grill. There are garbage cans for your trash - you are required to clean up after your party - next to the pavilion and restrooms are located nearby. There are parking areas adjacent to each site; all vehicles are required to have a parking/entry pass. Each pavilion can comfortably accommodate around 40 people. 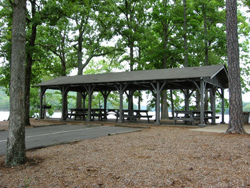 The picnic facilities can be reserved for a fee of $45 (call 1-800-864-7275 or online at www.gastateparks.org ). Reserved sites are marked with a reservation placard; if a group pavilion is not reserved you can use the facilities for free on a first-come first-served basis. You can check in to use your group picnic facility beginning at 10 AM and must check out by 9:45 PM. The two group shelter buildings are quite nice. They offer an opportunity to host a gathering in a very comfortable and well-equipped building. 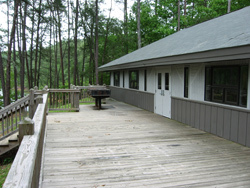 The group shelters are designed to be used year round; group shelter #1 has air-conditioning and both are equipped with heat. The shelters have a kitchen with stoves and refrigerators. Bathrooms and trash receptacles are also located in each building. There is one main hall that comes with tables and chairs. Barbeque grilles are also provided outside of each building. A security deposit is required when you make your reservation. 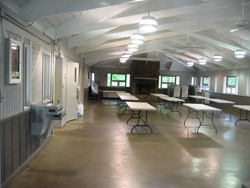 This is refunded after your event and once park management has checked to see that you have complied with cleaning the shelter according to the stipulated agreement (the "facilities will be returned as they were received " - put all your trash in the bins, clean up the kitchen, main hall, and surrounding outside areas, etc.). 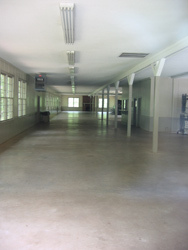 You can call for information about these facilities 770-975-4226. 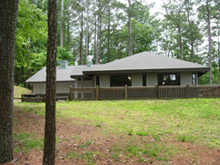 To make reservations you can call 1-800-864-7275 or go online at www.gastateparks.org. You can check in to use your reserved group shelter beginning at 10 AM and must check out by 9:45 PM. Keys and check in are handled at the Lodge office.